BepiColombo to Uncover Mercury's Mysteries. Mercury remains the most mysterious planet of our inner Solar System. BepiColombo, Europe's first mission to Mercury, will set off in October 2018 on a journey to the smallest and least explored rocky planet in our Solar System. 16 countries - laid out the scientific goals of the mission and presented the impressive four element spacecraft, in a final viewing before its launch next year. 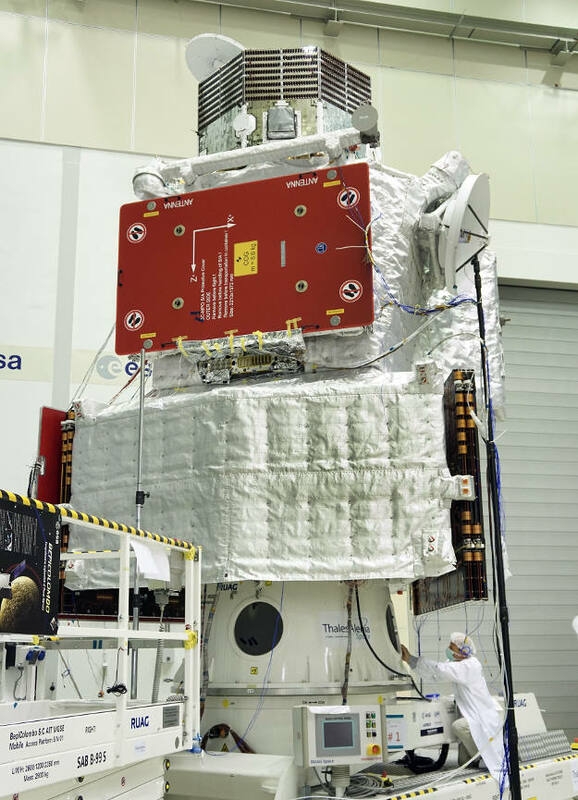 Piled up in a 6.4 metre high stack, the 4 tonne BepiColombo spacecraft is close to finishing its test campaign. It will be shipped to Europe´s spaceport Kourou in French Guiana in March 2018. The Sun's glare makes it impossible to study Mercury in detail using telescopes and the extreme heat and proximity to the Sun make it hard to reach. So far, only two NASA missions have visited Mercury: Mariner 10 in the 1970's and Messenger, which orbited the planet from 2011 until it ran out of fuel in April 2015. ESA and JAXA have teamed up for the mission BepiColombo. Named after the Italian professor Giuseppe 'Bepi' Colombo, who was instrumental in making the Mariner 10 mission such a success, the mission is made up of two separate orbiters, the Mercury Planetary Orbiter (MPO supplied by ESA) and the Mercury Magnetospheric Orbiter (MMO supplied by JAXA). 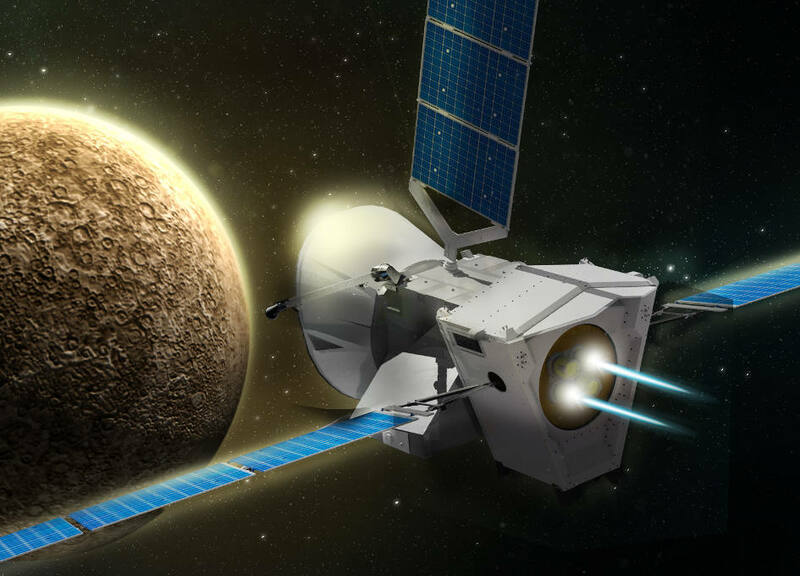 The BepiColombo mission will examine the peculiarities of Mercury´s internal structure and magnetic field generation, and how it interacts with the Sun and solar wind. It will investigate surface features and chemistry, such as the ice in permanently shadowed craters at the poles. The mission's science will significantly improve our understanding of the formation of our Solar System, and the evolution of planets close to their parent stars. Today is the last time that the complete stack will be on view in Europe. After testing the connection and separation systems with the Launch Vehicle Payload Adaptor System from Arianespace in late July the spacecraft will be disassembled by testing its module separation systems. Additional functional and performance checks will follow the mechanical test programme and then a final thermal test of the Transfer Module will be performed in November. At the end of March 2018, the spacecraft will be shipped to Kourou. Once in French Guiana, the team will reassemble the stack and install it on the Ariane 5 launch vehicle, with launch scheduled for October 2018. After a seven-year cruise, the Transfer Module will be ejected and the remaining modules will reach Mercury in December 2025. As prime contractor for ESA, Airbus is responsible for designing and building the Mercury Planetary Orbiter and all other European spacecraft hardware. Engineers have created a stacked spacecraft, so that both orbiters can travel to Mercury as one unit, served by a dedicated propulsion module for the transfer, the Mercury Transfer Module (MTM), also designed and built by Airbus. To travel from Earth to Mercury involves slowing the spacecraft and allowing the Sun's gravity to pull the spacecraft towards it - thereby reducing the size of the orbit. To arrive at the correct speed to be captured into orbit by Mercury's gravity, the spacecraft must slow by 7 km/s - this is seven times the thrust needed to reach Mars. BepiColombo achieves this braking by means of nine planetary fly-bys (1 x Earth, 2 x Venus, 6 x Mercury) and the use of an Electric Propulsion System (especially developed for the mission) to provide 4 km/s of the braking. After seven years of travel, and 18 orbits around the Sun to enter Mercury's orbit, the MTM will be ejected and the Mercury Planetary Orbiter will take over propulsion tasks. By means of a free gravity capture the stack will swing into orbit around Mercury and then descend successively to the scientific orbits. The Mercury Magnetospheric Orbiter will be spin ejected in its orbit before the sunshield is ejected and the Mercury Planetary Orbiter descends further to its target orbit. The orbiters will then conduct the most thorough examination of Mercury yet undertaken. As it is only 58 million kilometres from the Sun, Mercury presents a special challenge to visiting spacecraft. During the day, the planet's surface is baked to temperatures of 450 Celsius or more, hot enough to melt some metals. So spacecraft in orbit not only have to cope with the immense heat of the Sun, but also with the infrared radiation emitted by the hot planet. In consequence, Airbus engineers have covered every external surface of ESA's Mercury Planetary Orbiter, except for the single radiator side, with high temperature multi-layered insulation. The material, made up of 50 layers of ceramics and aluminium, was especially designed for the BepiColombo mission. The antennas are made of heat-resistant titanium, covered by a newly developed coating. As the MPO's mission is to investigate Mercury's surface, one side will always be facing the planet, so that the instruments can monitor the surface at all times, whilst the radiator faces away from the planet into deep space to reject heat. The prime contractor is Airbus in Friedrichshafen, Germany, with responsibility for the system design and realization, functional verification and the overall project management. The Stevenage, UK, team provided the structure and thermal systems for the MPO, and was responsible for the design and build of the MTM. Airbus in Madrid-Barajas, Spain, supplied the MTM structure. The Electric Propulsion System employs 2 PPUs (Power Processing Units) developed by Airbus in Tres Cantos, Spain. These 48 kg units process 5 kW power each with which to drive the ion engines of the Electric Propulsion System. The PPUs are designed such that the 2 units can operate simultaneously any 2 of the 4 ion thrusters with which the propulsion module is equipped. The MPO Solar Array, provided by Airbus in Ottobrunn, Germany, is a high temperature design operating at maximum 190°C, with specially developed components designed to be compatible with the thermal conditions. The solar array can deliver 2 kW. The thermal control of the array is achieved by a unique design involving a mix of cells and OSRs (glass mirrors) which occupy 17 percent of the panel area. The solar array is kept in a safe temperature range by controlling the tilt and continuously rotating the array as the spacecraft orbits Mercury. The MTM Solar Arrays, provided by Airbus in Leiden, The Netherlands, are also of high temperature design operating at maximum 190°C and use the same technologies as the MPO. Whilst approaching the sun the solar array output increases, accompanied by an increase of temperature. Once the array temperature has reached 190°C (at about 0.5 AU) the array must be tilted, thereby reducing its projected area and limiting its output. The two wings total 40 m2 and have a mass of 290 kg.